We need to consider people if we want to use data to change the world. In the age of ubiquitous technology, there is data all around us. Satellites up in space collect images of the planet we live on. Down on earth, we look at stats to optimise public transport or the healthcare system. And I bet you have a friend who counts their steps and tracks their sleeping pattern, right? In all these cases, we curate vast amounts of data to reflect (and possibly act) upon. We’re looking for information to help us improve our well-being or to map the fastest route to our friend’s house. But the underlying data may be complex and difficult to make sense of. And most of us are not scientists or statisticians, and we are not trained in analysing data. That’s why apps and websites pre-process the data for us and present us with a user-friendly interface. This is where Human-Computer Interaction and the people who study it come in. I am one of those people and I investigate how to create more impactful data visualisations, to help people consult complex data and make the most of it. I am currently working with the University of Cambridge and Vizzuality. Literacy, Numeracy, and Visual Communication. Literacy refers to our ability to process information. Imagine you work for a tech customer support hotline. You will need to pick out how tech-savvy the person on the phone is. Their computer literacy will influence the way you speak to them (and whether you ask if they’ve tried restarting). Data often is quantitative in nature, and thus requires numeracy skills. We first learn to count with an abacus, and soon enough we use a calculator. Hardly evidence of our inbuilt numerical genius! And let’s be honest, few people get excited about spreadsheets full of data. Luckily, some do. Data experts sort through the numbers for us and then point us to the meaningful patterns in the data. A great solution to communicate these meaningful patterns is to visualise the data. That’s because visualisations support our cognitive processes, they help us think. Visuals are often easier and faster to process than numeric or semantic information. For example, I could tell you that in 2017, most tourists visiting Spain were British. Most tourists visiting Britain were French. Most tourists visiting France were German. Most tourists visiting Germany were French. And so on. But I’m guessing I have already lost you because you are looking at the map instead. The illustration by ‘a map a day’ shows the same information in a much more interesting format. In a nutshell, visualisations have benefits for information processing. They might even be fun to delve into. Sounds good, but there is a catch. Much like we don’t do a lot of mental maths (so we use calculators to help us), we don’t practice reading sophisticated visualisations. Only good visualisations are helpful. Poor visualisations can, in the worst case, mislead and obscure meaning. Mind the Reader’s Mind and the Purpose of your Visualisation. Experienced data scientists follow a user-centric approach to prevent this from happening. User-centric visualisations follow principles in line with visual perception and cognitive processing. A straightforward principle is providing all the information needed to interpret the graph. Keys should be easy-to-read, and one should avoid cryptic units or abbreviations. How do you feel about pie charts? Some love a good pie, others despise them. Only, pie charts are neither good or bad; it depends on the purpose. Visualising a hand full of categories in a pie chart is legitimate, as in the left example in the picture below. But chances are you have seen charts like the pie on the right, with way too many slices to be able to tell any of them apart. Opponents of pie charts point out that we aren’t naturals at judging angles. Indeed, in this pie, the angles are very narrow and it’s almost impossible to compare its parts. To make things worse, the colour-coding is ambiguous and the key is full of cryptic labels. Images retrieved from Pixabay (left) and Friendly, Michael (2001), Gallery of Data Visualization, Electronic document, http-//www.datavis.ca/gallery/, Accessed- 11/01/2018 11–26–21(right). Let’s look at another example of a modern data vis challenge. Utility companies are installing Smart Meters and giving In-Home Displays to customers. This is what current In-Home Displays look like: they tell the user whether usage is low (green), medium (amber), or high (red), and the total cost of energy spent so far. What else could we do? Smart meter data consists of a timestamp and a power reading. The intuitive option is to draw a line graph with time on the horizontal axis and power on the vertical axis. Let’s imagine we have data for every device in the home. The example by Kelly and Knottenbelt (2015) shows usage data for different appliances. This is a very useful visualisation for researchers to see what’s what. Kelly, J., & Knottenbelt, W. (2015). 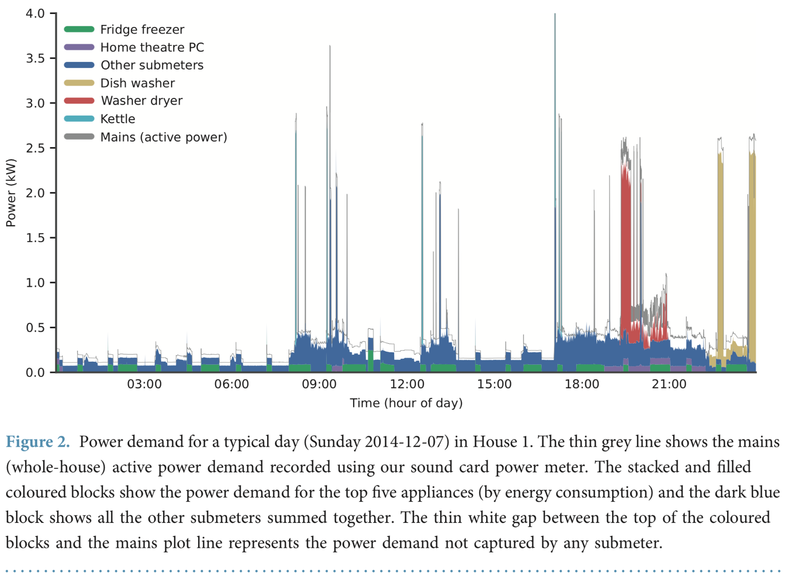 The UK-DALE dataset, domestic appliance-level electricity demand and whole-house demand from five UK homes. Scientific data, 2, 150007. But would we be showing this to householders? The visual system is good at detecting deviations from the horizon. That explains why we’re good at reading bar charts. It also means that, in line graphs, untrained users tend to focus on the peaks, and neglect the baseline and trends. Did you realise in the time series above how much the fridge consumes over the course of the day? I’d argue the pictographs below put things into perspective. The size of every pictograph is proportional to the energy it’s consumed. For a householder to learn where they are using most energy, the pictographs are quicker to compare than colour-coded lines in a time series graph. Applying guidelines to complex digital tools is harder than it may sound. Classic graph theory addresses static charts, but not today’s plethora of interactive websites. We often face intricate choices: visualise as much data as possible, or simplify? We have to balance the need for accuracy and the risk of overwhelming, or even confusing, the user. Cognitive research hasn’t kept up with the fast-paced evolution in data vis. There is a need for more context and a user-centric perspective. The data science community has advocated to supplement ‘big data’ with ‘thick data’, the latter being ethnographic data that provides insights into human preferences and behaviour. In summary, data visualisations help us understand data. They decrease our mental workload, and ideally, make data more fun to engage with. The task at hand is to collate existing guidelines, and to research how they apply to complex visualisations. Going forward, we want to provide extended principles on how to best design for users to easily and quickly extract meaning. My role is to review the status quo of environmental data vis, and to run a set of evaluation studies. These will include think-out-loud interviews, eye-tracking and large scale online surveys. The aim is to support Vizzuality’s efforts to visualise data to drive positive change in the world. To that end, I’d love for you to join my journey here on Medium, to leave comments below or email me your thoughts at melanie.herrmann@vizzuality.com. Melanie is a Human-Computer Interaction Researcher who aims to understand the psychology behind effective data visualisation and how we can make better, more impactful data visualisations. Melanie’s research is made possible through the Knowledge Transfer Partnerships scheme managed by Innovate UK, the UK’s innovation agency, and is conducted with the support of our partners in the Department of Psychology at Cambridge University. Psychologist, Environmentalist, Human-Computer Interaction Researcher. Based in London/Cambridge, UK. Posts on data design, user research, open data, and software development. We create tools and applications with a lasting benefit to society and the environment.